I have had a very Harry Potter week, and I'm not complaining!! Last Saturday was the annual Chestnut Hill Harry Potter Festival & Quidditch Tournament, and this past Thursday was Harry Potter trivia! The restaurant that we go to for the trivia has it in July and October, which is fantastic! I did both of these events with Samantha and Noelle, and their sister Claudia came with us to the festival. So! Let's talk the Festival first. It was probably the biggest one that they've had. I've been going for the past three years since I first got into the fandom, and every year I've had an absolute blast. 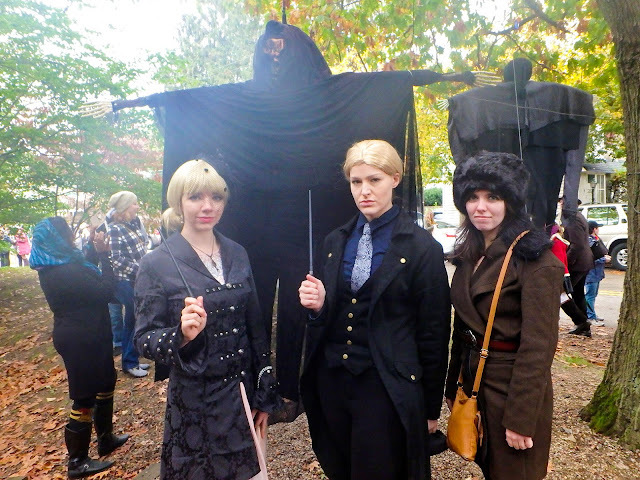 We decided this year we wanted to dress up as Death Eaters. For whatever reason, one of my favorite Death Eaters is Yaxley, probably second only to Lucius. Why? I couldn't tell you, but I've just clung to him. 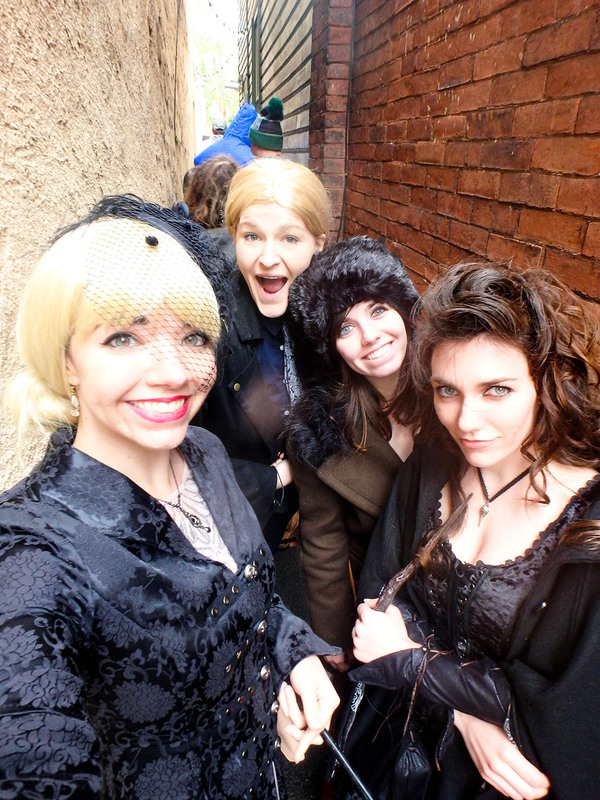 So I decided to go as Yaxley, even though everyone thought I was Lucius. We decided he wouldn't be flattered by the confusion. 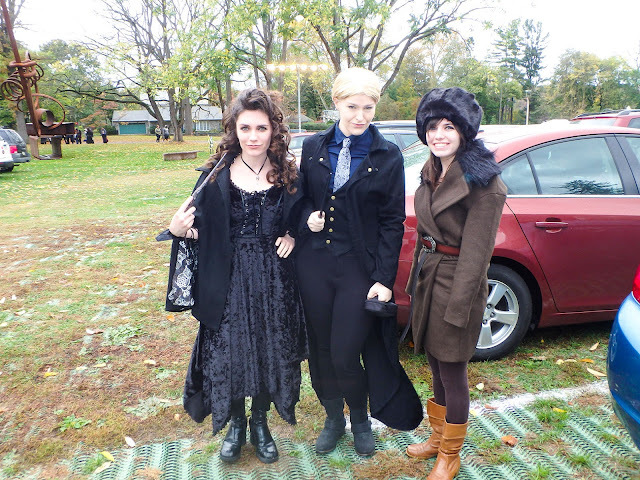 Samantha went as Narcissa, Noelle as Bellatrix and Claudia went as her favorite Death Eater, Karkaroff! 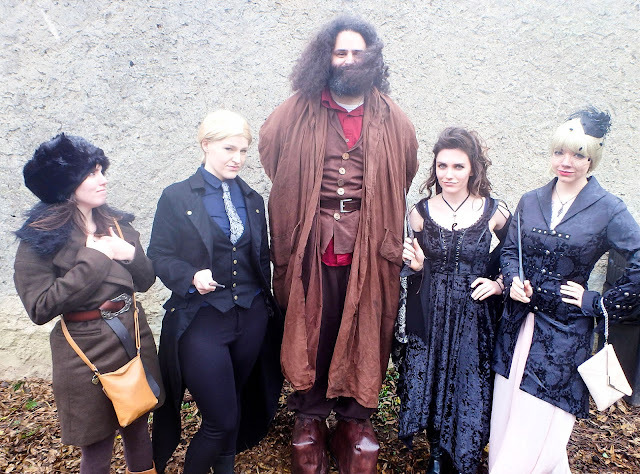 This festival has been based around a Harry Potter academic conference that is held at Chestnut Hill College. They have the conference on Friday afternoon with a pub crawl on Friday night. Saturday is the festival and Quidditch Tournament. I think they do a really great job at making this a super fun event, despite all of the complaints they got this year. They got a bunch of national coverage, which is great, but I don't think people really understood what this was. People flew in from all over the country and Canada, and were let down by the event, which makes me sad. The Festival takes place up in the town area, which is like the quintessential Main Street, USA. There are a ton of small business shops and restaurants and everyone gets in on the gimmick. 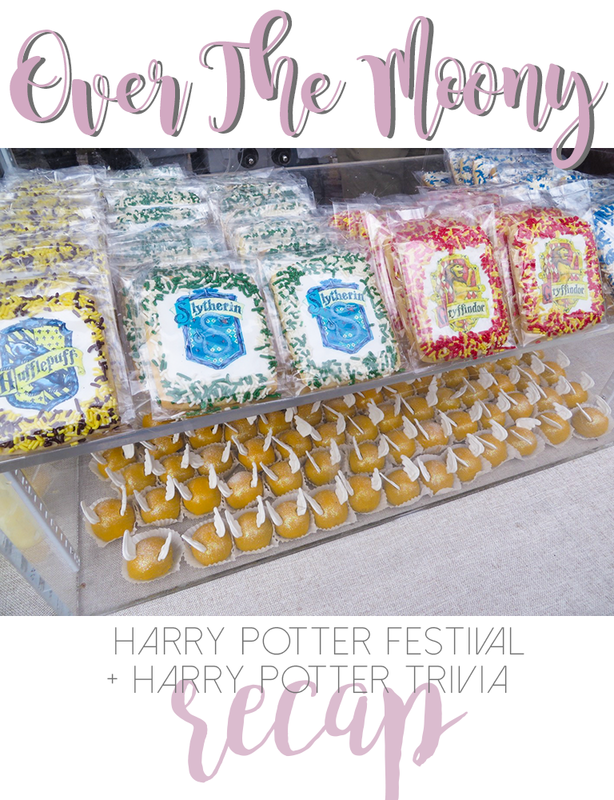 There are Harry Potter displays, tons of Harry Potter baked goods, and people order in special merchandise to sell. There are also street vendors who make their own goods to sell. The past couple years they didn't have the street shut down, which was tough because it was hard to navigate through the sidewalks since it was crazy crowded. This year they had the sidewalk closed and it was amazing. It was still very crowded but it was a lot more manageable! They also have the Quidditch Tournament, which is down at the college which is about a mile away. There's a lot of walking at this festival but it's so worth it! Muggle quidditch is one of my absolute favorite things to watch and we obviously don't get to watch it too often! This year the organizers included an art gallery where people could submit pieces to sell and display. 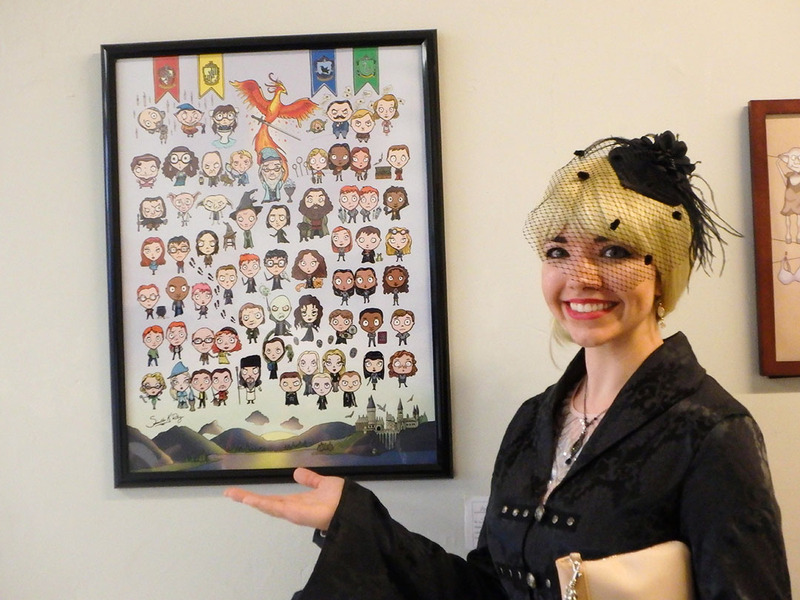 Samantha put together this amazing piece and sold out of the prints she bought! We had a total blast. It was fun going dressed up and we're already working on next year! We know what we're doing, just need to put it into practice. Luckily (and sadly), we have quite some time to put it together! Next up was trivia! We are defending champions (2 times), not that they really keep track of that but lord knows we put more than enough pressure on ourselves about it! We split up the books between us and were reviewing notes, re-reading/listening to audio books. It was some insane prep we put in in a month. We didn't feel terribly confident going in but figured at the very least, we'd get some delicious food out of it! Well, to our surprise, we ended up winning! Not by much, it was very close, but nonetheless! Among our prizes, we get a gift card, of which we have three unused ones, so we're going to have ourselves quite a feast soon! And that was my amazing Harry Potter week. I hope you enjoyed reading about it! Have you ever gone to any Harry Potter events or trivia nights? Let me know about your experiences below!